THE WORLD'S ULTIMATE 20" HARDTAIL TRAIL MACHINE! THIS MODEL IS OUT OF STOCK UNTIL MID-MAY 2019. Building on the highly sought after Savage 2.0, the new 20” Yama Jama raises the bar for kids’ trail bikes significantly. 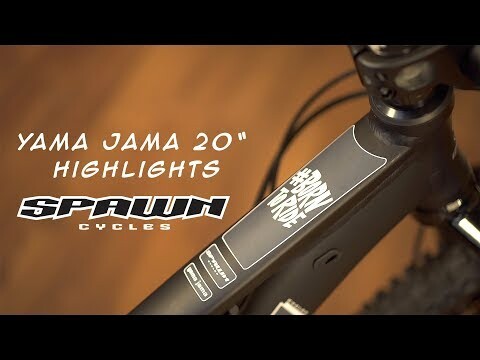 The skeleton of the 20” Yama Jama is simply awesome! It all starts with a 6061-T6 alloy frame using hydroformed and double butted tubing, a semi-integrated head tube, a unique forged BB shell/yoke for added stiffness, ISCG-05 tabs and even an internal routing option for dropper posts. The most impressive part of the base in our opinion though is the Brood Bike Co. Eldorado fork. The fork features a hand laid carbon fiber lower, a replaceable cartridge damper with a rubber bladder, lockout, a 15mm through axle and 80mm of plush, nearly stiction free travel. With a base like that, we couldn’t skimp on the components... The drivetrain starts with the Brood Bike Co. Styx 130mm crank using a SRAM pattern direct mount interface for the chainwheel and a sealed external bottom bracket. We add a Brood 30t narrow wide alloy chainwheel and then utilize a SRAM GX derailleur and shifter combo to get things moving to the 11-36T 10 speed SRAM cassette. Stopping is handled by powerful Tektro Auriga hydraulic discs. The next big highlight is the wheelset and tires. The Yama Jama uses Brood Bike Co. tubeless ready rims with a wide profile and tops it off with the amazing Brood Maxtion foldable, tubeless ready tire. Touch points matter for kids too, so we’ve topped this Yama Jama off with Brood Tenderiderz lock ons and the Brood Throne seat with a unique Pivotal mechanism that provides fore/aft adjustment. Simply put, this is the ultimate 20” hardtail trail bike in the world at the moment!